Sorry boutcha, chickens. I’ve done years and years of research on the subject, including being subjected to several backyard barbecue versions of the dish, and the vast majority of chicken kebabs are terrible. Dry. Tasteless. Stringy. Somehow simultaneously burnt and raw. Loathe to be removed from the stick on which they are skewered. 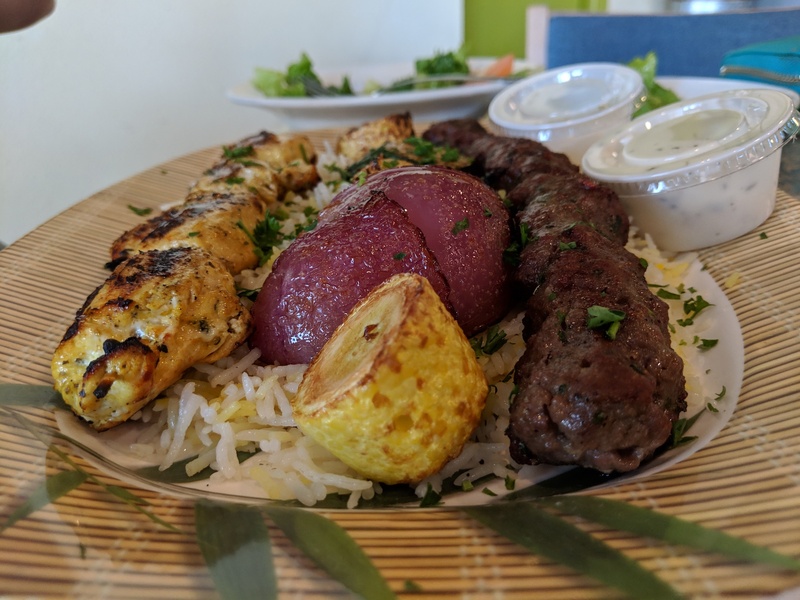 The enormous chasm between normal (re: awful) chicken kebabs and those worth eating is on full display at Jerusalem Mediterranean Cuisine in Edmond where they serve chicken tawook. Here’s the problem: there are so many delicious things on the menu at Jerusalem that it’s almost a guarantee that you won’t order the chicken kebabs. In fact, the people who are rewarded with these delightfully tender, juicy, flavorful char-grilled pieces of chicken are those I think deserve it the least: cowards. Yeah. Cowards order chicken kebabs. Faced with a slate of mouth-watering dishes — everything from lamb shank to an okra plate — ordering chicken is akin to raising a boneless, skinless white flag in surrender. But at Jerusalem, the owners have chosen not to scorn these lily-livered risk-averse scaredy cats, but bestow upon them that gift most rare: a truly tasty chicken kebab. Yes. Order the chicken tawook ($12.99). It’s just so good, it will actually redeem white meat chicken for you. You get 12 ounces of chicken that has been lovingly marinated and grilled with the attention to detail necessary for preparing this ultra-lean meat properly. The fact that most people do not give it that kind of attention is just another commentary on the sad state of humanity. We should be ashamed. As with all the entrees, chicken tawook comes on basmati rice. But...that’s not how you should get it. For an extra $2.50, you can get either hashwa or mojaderah. Hashwa is rice and beef and almond slivers cooked in clarified butter and mojaderah is rice cooked with lentils and caramelized onions. Either one is a worthy upgrade. If you’re not content being lumped in with the chicken cowards, you should get either the Combo Plate ($12.99) or the Mixed Grilled Kabob ($15.99), which have that tasty chicken...and more! The Combo Plate adds on a kufta kebab — spiced ground beef shaped around a skewer and grilled over an open flame — and the Mixed Grilled has kufta and lamb kebabs. Definitely worth a few more bucks. 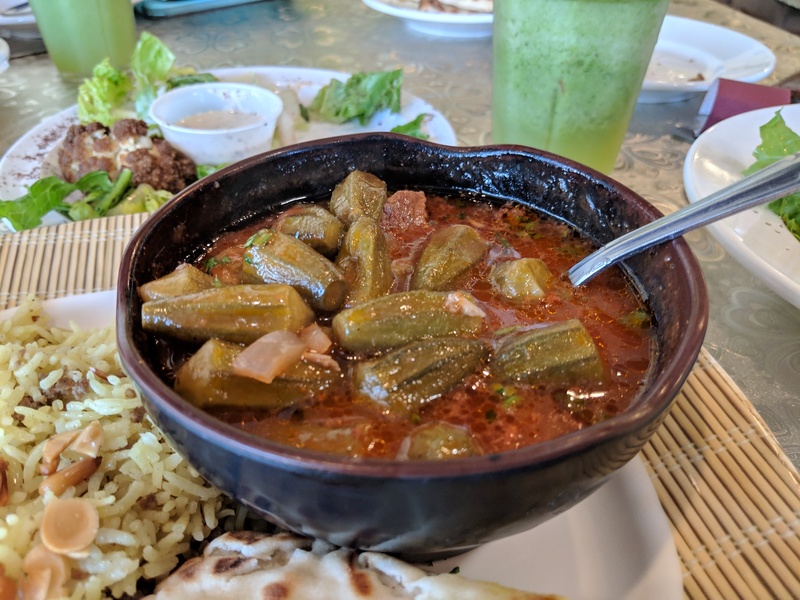 The last time I went to Jerusalem, our server completely misread my feelings toward the Okra Plate ($10.99), which is a tomato and beef broth stew filled with whole mini okra and bits of beef. The fact there was still some remaining in the bowl wasn’t an indication that I was unsatisfied with the dish — it’s got an acidic kick that some might not favor, but I thought was pretty good — but with the sheer amount of food we’d already consumed. 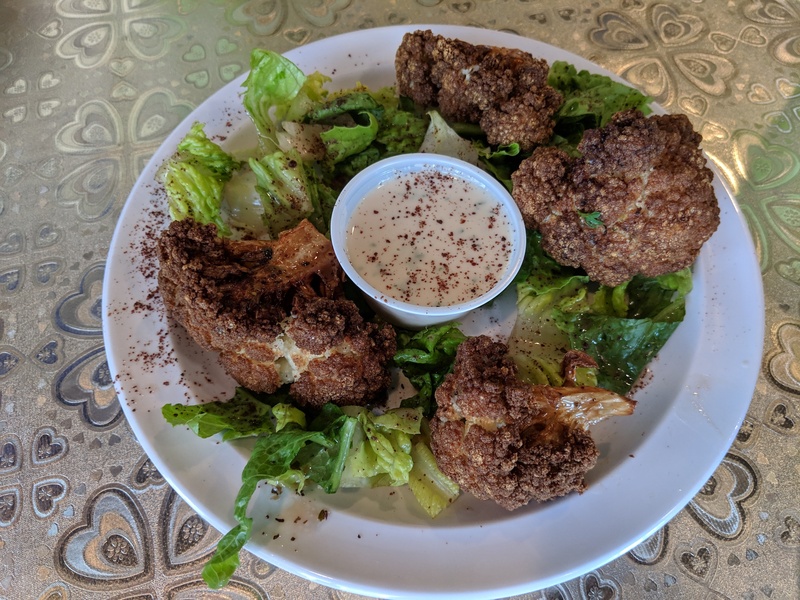 An appetizer of Fried Cauliflower ($6.99) might not seem huge, but with all the pita and the tahini dipping sauce, it started to feel heavy. Oh, by the way, fried cauliflower is delicious. Nutty and tender and probably completely unhealthy, but I don’t care even a little. It was great. Another excellent appetizer, in case you’re tired of always getting hummus, are the cabbage rolls ($3.99). Stuffed with beef and rice and well seasoned, these rolls are filling and warm and wonderful, especially when the weather outside is inhospitable. Hey, you know what I love? Gyros. I don’t care that they’re manufactured cones of Mediterranean meatloaf. I. Don’t. Care. 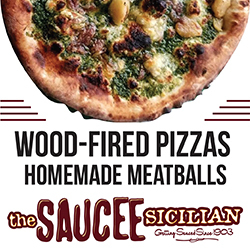 If Soylent Green tasted like this, I’d be eating people all day every day. The gyro sandwich ($6, combo with fries and drink $9) is very good. Lots of gyro meat. Thinly sliced onion, chunks of tomato and crisp lettuce leaves. It’s exactly what you think it is, which is exactly what you want. The only thing it really needs added is a kindly older person to stand by the table while you eat it, reminding you to slow down, breathe and enjoy it instead of shoving the entire thing into your mouth like a demon in a soul-eating contest. 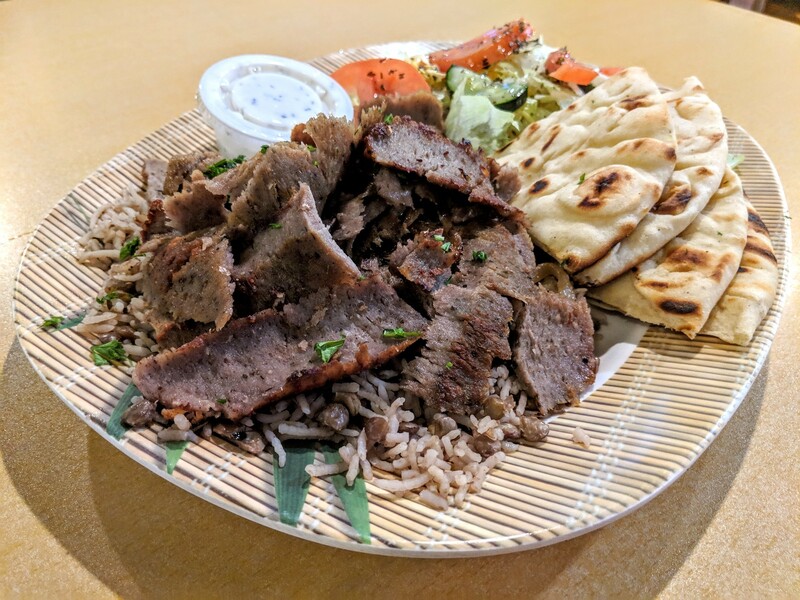 The gyro plate ($10.99) is all that gyro meat you love, plus pita and rice and some salad. 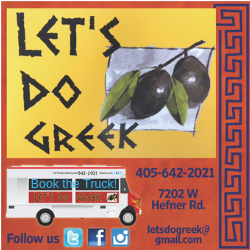 Because you don’t always have to eat a gyro likes it’s trying to escape from you. Sometimes you can read the Internet on your phone and slowly spoon bites of heavily spiced beef and lamb into your mouth with rice and a drizzle of tzatziki sauce. You know, like a fancy King or the Pope would do. What’s really crazy is, that’s barely scratching the surface of Jerusalem’s menu. It doesn’t seem huge, but there’s a lot of variety in those pages and I highly recommend you go in and explore for yourself. And if your friend who’s afraid to try new things insists on coming along, let him have the chicken. It may be the coward’s way out, but it’s also just about the best chicken kebab I’ve found.